When she chose to spend her sabbatical in 2014 conducting research at the BecA-ILRI Hub, Jacinta Akol from the National Crops Resources Research Institute in Uganda had no idea that this research would win her international awards. 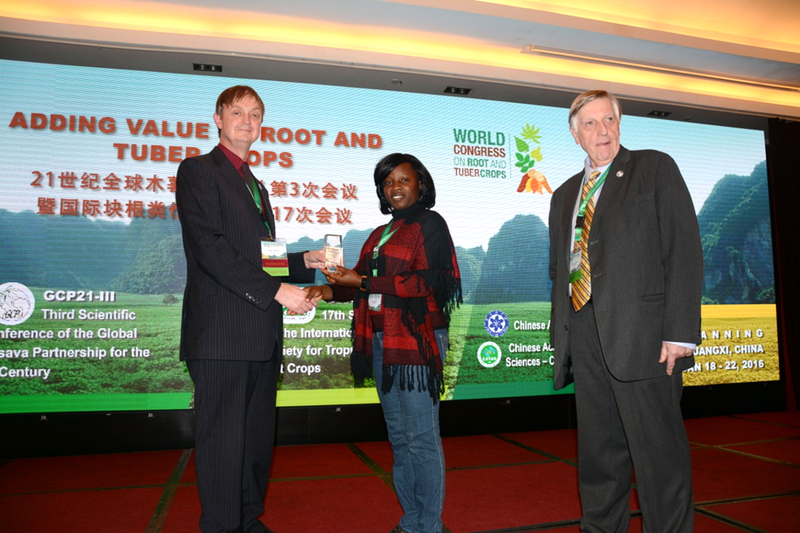 During the First World Congress on Root and Tuber Crops (RTCs) meeting that took place in China from 18–22 January 2016, Akol was awarded the Pat Coursey prize in recognition of her contribution to research on yams in Uganda. The research done on this under-studied, underutilized food crop by Akol through an Africa Biosciences Challenge Fund fellowship. Akol reiterated the impact of the fellowship at the BecA-ILRI Hub in defining her scientific goals and giving her career more focus. ‘While at the Hub, I was able to sharpen my skills in networking, adoption of modern scientific techniques and most importantly effective communication,’ said Akol. ‘This has really boosted my confidence and profile as a scientist’ she added. Akol stated that the BecA-ILRI Hub is an extremely significant investment in raising agricultural research in the region. ‘At the BecA-ILRI Hub, science leaders who will improve the face of agriculture in Africa are being created,’ she said. ‘It is important that African governments support such organizations which exist to support our national agricultural research systems,’ she added. Root and tuber crops, including yams, cassava, sweet potato, potato, cocoyams and other root crops are important to agriculture and food security of more than 100 countries. In Uganda, yam is increasingly gaining importance as a source of income for smaller holder farmers. The RTCs congress aims at raising awareness of the importance of the RTCs in the world. It reviews scientific progress; identifies new opportunities; and sets priorities to tackle challenges including finding the resources to support research and development in areas where it is currently inadequate or lacking. The Africa Biosciences Challenge Fund (ABCF), managed by the BecA-ILRI Hub, provides fellowships to scientists and graduate students from African national agricultural research systems to undertake biosciences research-for-development projects at the BecA-ILRI Hub. The ABCF fellowship program develops capacity for agricultural biosciences research in Africa; supports research projects that ultimately contribute towards increasing food and nutritional security or food safety in Africa; and facilitates access to cutting-edge research facilities by African researchers.